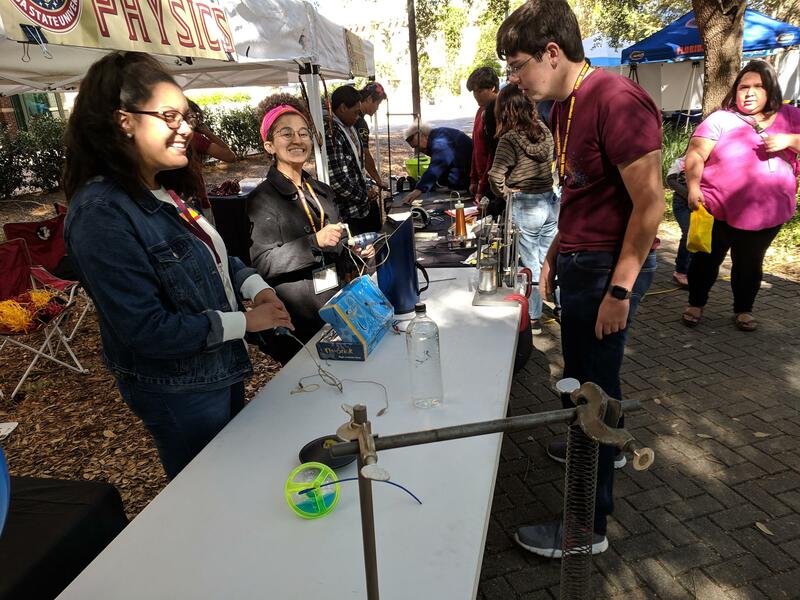 The yearly Tallahassee Science Festival happened on Saturday, Nov. 3. The power of human technology was on display, along with the power of nature, as exemplified by the recent hurricane. Science Festival visitors checking out the Florida State University Physics Department booth. The Florida Forest Service's Todd Schroeder was showing how the storm's debris was perfect kindling for wildfires, even in urban forests. "Do the little things around the house," he pointed out while indicating two miniature representations of cleared vs. cluttered yard spaces. "To make sure that things are away from the home that could start on fire and invite fire into the home." Another booth showed how climate change is fueling higher sea levels and temperatures, thus increasing hurricane severity. Gulf Specimen Marine Lab Director Cypress Rudloe experienced that severity firsthand. He battled his way into the storm-damaged facility to get emergency power to his sea creatures' life support systems as Michael roared away. "You got a little window here of time and as that oxygen depletes out of the water and it's that quick. You start losing stuff, so we definitely got right to the brink and pulled it back!" he recalled. Other exhibits focused on everything from health care science to advances in robotics and artificial intelligence. Hurricane Irma very nearly put a beloved Panhandle landmark out of business. But instead of closing their doors after 54 years, Panacea’s Gulf Specimen Marine Lab is up and running. A crowd estimated at more than 2,000 marched to the Florida State Capitol on Saturday. It was part of a global Earth Day observance that in the U.S. included a battle against budget cuts to science-based programs and agencies proposed by the Trump Administration.